The city of Bahia de Caraquez on Ecuador’s Pacific coast is committed to becoming ecologically sustainable. Planet Drum Foundation (PDF) was invited to the 1999 Ecological City Declaration Celebration to help create community awareness of relevant issues in the local Rio Chone Estuary Bioregion. You are invited to assist in the project. Please inform us of your interest as early as possible so that we can provide details. 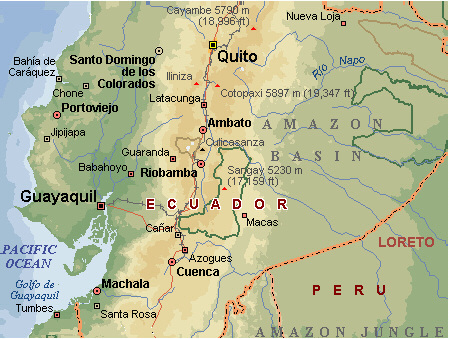 See Volunteering in Ecuador and E-mail planetdrumecuador@yahoo.com or call (415) 285-6556. Thank you for your generous funding to support PD's Revegetation Project during 2011. Click on pictures for larger version. Over the last decade PDF has established a field office to carry out pertinent bioregional activities. 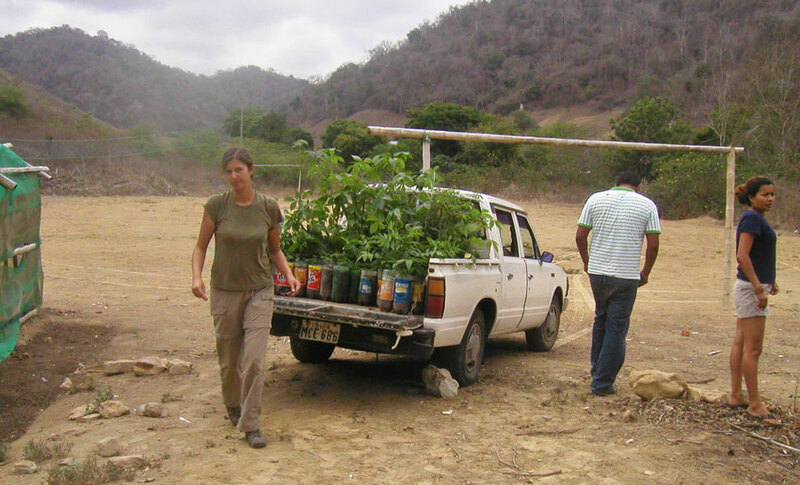 We planted native trees in a barrio that was destroyed by mudslides, thereby controlling erosion and creating habitat for indigenous animals in a “wild park” only a few blocks from the city center. Since then we have continued to extend revegetation efforts every year on eroded hillsides along the Rio Chone. 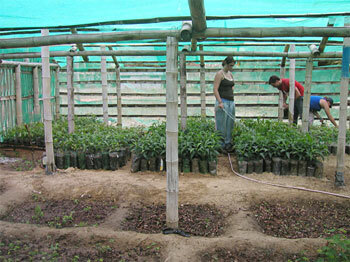 Saplings are grown in a large greenhouse and have been planted in more than two dozen sites. PDF also carries out an annual after-school Bioregional Education Program (BEP) for secondary school pupils. There are opportunities for future projects involving renewable energy, water supply, household ecology education, community education and outreach, and others. We are constructing the Bioregional Sustainability Institute to provide more advanced students with a Master of Bioregional Sustainability Certificate. This page is the central index to the materials which document the ongoing collaboration between the Eco-City of Bahia de Caraquez in Ecuador and Planet Drum Foundation, planetary citizens who may be separated by national boundaries but share a common devotion to a more natural agenda in our social relations. Below are brief descriptions of the Reports, Dispatches, Model Laws, City Plans, Education Plans, Mandates, etc. by year and also with links. The index of materials below shows the most recent items at the top. For a historical perspective, start at the bottom of the page and view the materials in reverse order. Clay Plager-Unger and new Field Manager Orlando Arias continue revegetation projects. In addition Sustainability Institute Classes will be taught by them along with Ramon Cedeno Loor. The Bioregional Education classes will resume in May with three classrooms again this year. Clay Plager-Unger and new Field Manager Orlando Arias continue revegetation projects. The Bioregional Education classes resumed in May with three classrooms again this year. Ramon Cedeno Loor continued as the main Bioregional Education teacher, and additional classes concurrent were classes taught by Margarita (Avila) Plager-Unger and Nadine Flexhaug. Peter Berg visited in November to help initiate the first classes of the Bioregional Sustainability Institute. Peter Berg visited for the 10th Anniversary of of the Eco-City Resolution. Clay Plager-Unger currently continues as Project Manager. Jaime Andraide worked as the Field Manager during the first six months of the year. Ramon Cedeno Loor continued as the main Bioregional Education teacher, but additionally classes were expanded to include two other concurrent classes taught by Paola Divita and Fabiola Coello. Clay Plager-Unger and Jaime Andraide continue revegetation projects, expanding the number of sites and the greenhouse. Clay also continues exploring the land for the Bioregional Institute. Ramon Cedeno Loor has a new Bioregional Education Class with students from the previous Advanced class acting as assistants. The Bioregionalism textbook is updated. There are many pictures of new and old sites and of the education classes. Peter Berg's Dispatches include Bahia's Eco-City Mandate 2008, discussions about Ecuador's new constitution and its “Rights of Nature,” and a document describing Planet Drum's Bioregional Sustainability Institute. Judy Goldhaft's journal entries describing her adventures in Bahia and as a Planet Drum revegetation volunteer are included with the Dispatches. In January Clay Plager-Unger came to Bahia to be Planet Drum's Field Projects Manager and joined Ramon Cedeno Loor, the Bioregional Education Manager. During this year Jaime Andraide, a local who is an expert Ecuadorian forestry, became the Field Manager for the Revegetation projects in Bahia. Clay worked closely with Jaime and included both their work in his Reports. All Clay's and Ramon's Reports as well as Peter Berg's Dispatches are indexed here. In March, 2006, Patrick Wylie replaced Heather Crawford as Planet Drum's Field Projects Manager in Ecuador. Ramon Cedeno Loor replaced Valentina Caminati as the new Field Bioregional Education Manager. In November, 2006, Dan Robbins replaced Patrick and he and other volunteers continued sending updates on the work in Eco-Ecuador. 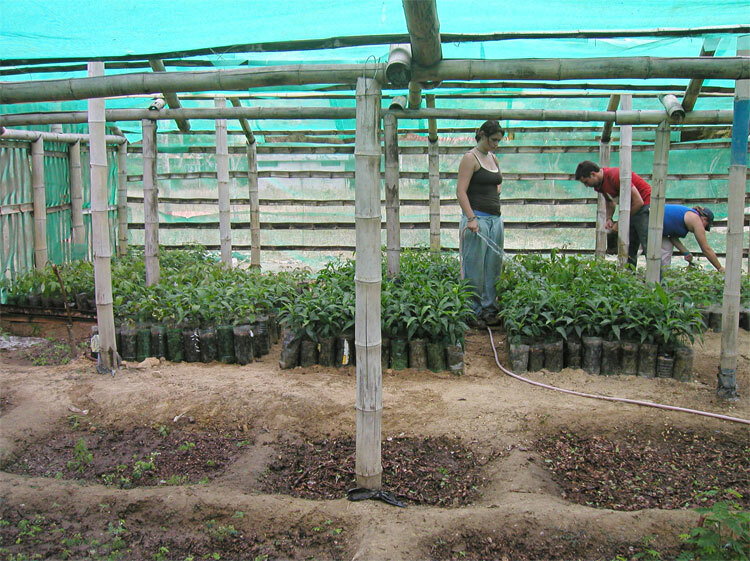 Peter returned to the Eco-City project in Ecuador in March and later in September, 2006. He sent dispatches to report on the project's progress as seen through his eyes. Riccardo Clemente held Solar Energy workshops and built a Solar Hot water with local contractors Heater in January. Heather Crawford began training to become the new Field Projects Manager in February 2005. Kristen Lansdale joined her in April to head the new Bioregional Education Program. 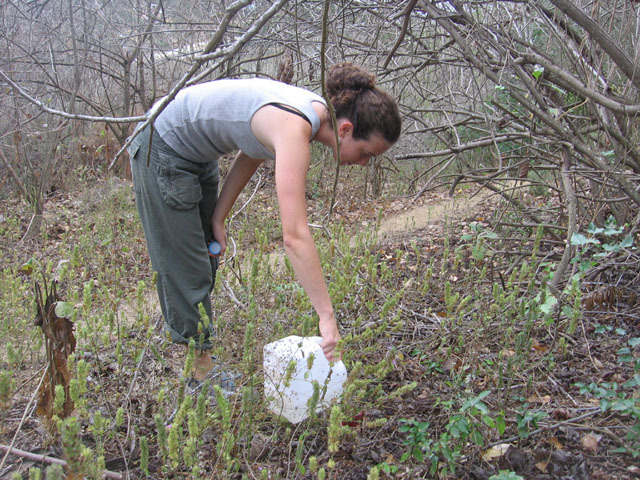 Renée Portanova, previous Field Projects Manager, left at the end of March 2005. 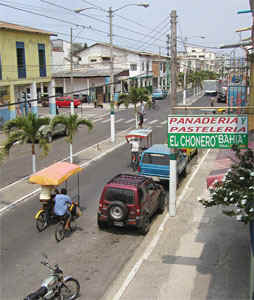 Peter returned to the Eco-City project in Ecuador in early February, 2005. His first Dispatch arrived near the end of February. He sent four Dispatches during this year. Renée Portanova arrived in Bahia in late January and after working as a volunteer, became the new Field Projects Manager after Brian left in May. Her and other volunteers' reports for 2004 are here. Peter returned in early June, 2004, to the Eco-City project in Ecuador. He began sending dispatches soon after. The first Dispatch is the often-reprinted essay Learning to Partner with a Life-Place. Peter Berg and Elise Braaten collaborated on a neighborhood oriented educational curriculum that will be launched June 2004 by Planet Drum Foundation in Bahia de Caraquez. We started out the new year with one volunteer, Simon Winch, working on the Eco Ecuador Project. In early January Peter arrived, and about a week later Brian Teinert, who has been hired as chief of operations for Planet Drum's projects, arrived to carry on the work. Peter was busy organizing the projects in Bahia and introducing Brian to everyone. In mid-January Peter sent a comprehensive dispatch which reviews Planet Drum's accomplishments and visions over the past five years in Ecuador. He returned to Ecuador in November and continued sending Dispatches. There are work opportunities that include volunteer and paid positions for people who would like to contribute their energy and time in collaboration with the Eco Ecuador project. Peter Berg gave a presentation in Ecuador (21 Feb, 2003). This talk represents the latest strategic thinking on creating sustainable bioregional activities. Fall 2002 Ecuador volunteers included: Jeff Goddin, Kristen Ford, Chris Haaf, Sara Gomez (& Matt), Rita Higgins, Simon Winch, and others for short times (Justine and Maggie, etc.) Jeff continued to send reports, and Kristin, Chris, Sara and Matt, and Simon also sent reports. Several volunteers have joined Peter back in Ecuador to continue the revegetation work amidst downpours and mud slides. These Dispatches include a Statement of Intent to revegetate eroded hillsides, and a Management Plan for Fanca Produce Composting. Peter returned to Ecuador to continue the work on Eco City. He continued the tradition of sending back dispatches for his faithful readers on the web site. Amy Jewel worked in Ecuador this Spring (2001). She sent two reports that follow up on the events set in motion with the Eco Committee's proposals and subsequent Public Meetings held in February. Final version approved Feb. 15, 2001 by the Public Meeting. in English and Spanish. Peter Berg returned to Ecuador in January and February, 2001, to continue work on the Revegetation project and to participate in the growing Eco-Ciudad movimiento in Bahia de Caraquez. These are his reports from the scene. The series of meetings that Peter describes is important because it represents the institutionalization of an ecological agenda that has developed over the past two years. Peter also lays out numerous opportunities for individuals or groups to contribute either through volunteer work, or donation of materials and supplies, or monetary contributions to the success of this experiment in creating green cities. Planet Drum Foundation launched an Eco-Bahia Ecuador Support Group at an event in San Francisco December 8, 2000. Representatives of the Ecuador consulate and Planet Drum welcomed the gathering and reported on the progress in the Revegetation Project and the Eco City planning. The success of the event was in no small part due to the donations from local eco-friendly firms, and the several volunteers whose work provided a wonderful time for all. Claire Dibble sent two reports "from the ground" on the Eco City hard work of planting the hillsides, frantic about the coming rains and with fervent wishes that the native vegetation will hold when the storms come this winter. Planet Drum staffers Peter Berg and Judy Goldhaft returned to Bahia in early September 2000 for further work in various areas of urban sustainability. These dispatches tell the status of their efforts in the hillside revegetation, water supply, alternative energy and other projects. The City of San Francisco adopted a resolution commending Ciudad Bahia de Caraquez of Ecuador on becoming an Eco-City, or "Cuidad Ecologica". Carey Knecht writes, "I joined up with Planet Drum and the Eco-Bahia project because I was deeply inspired by the task of integrating nature and a city. 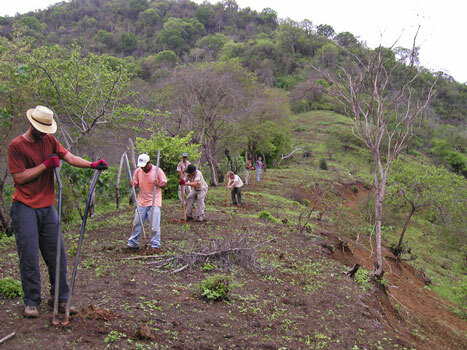 That is a task that requires not only reforesting one hillside, but actually changing culture. ..." In Carey's reports from February-March, 2000, we learn how she attempted to carry out this vision. On his third visit to Bahia, in February 2000, Peter Berg opened Planet Drum's local office and inaugurated the Revegetation Project, to restore the hillsides devastated by the 1998 El Nino mudslides. Peter sent six dispatches that reported on this work. In order to get a first hand view of the situation since the Eco-Gathering, Peter made a second visit to Bahia in August, 1999, accompanied by Judy Goldhaft, Planet Drum's Managing Director. They wanted to survey the positive activities that the Bahians had already started, what support they needed, and how their projects could be tied to large-scale infrastructure improvements. The resulting report by Peter Berg outlines the Planet Drum proposal. Out of the meetings that Peter had in Ecuador came the following By-Law declaring Bahia de Caraquez an Eco-City. We offer it here as a model that other municipalities may use in developing language appropriate to their specific bioregions. Patricio reports on subsequent activities after Peter left to return home at the end of March, 1999. Includes photos of the first plantings in what would become the revegetation project. Peter Berg went to Ecuador in February, 1999 to attend the International Eco-Gathering and help the local ecologistas organize in the midst of natural disasters that have beset the Bahia de Caraquez region over the past two years. We anxiously awaited for these seven dispatches that Peter sent back over the two-week period. These reports from 1999 illuminate the genesis of this unique collaborative effort.